I Haven't been able to get it working in PhpStorm 6. When I add an absolute path I get an error when it tries to compile the watched files saying less.min.js is not a valid Win32 application… Is there a chunk of the manual missing on how to actually get any of these watchers working? I'm pretty keen to get this working cross platform, hence the desire for relative paths. Program is an executable. In your case it's a less compiler. 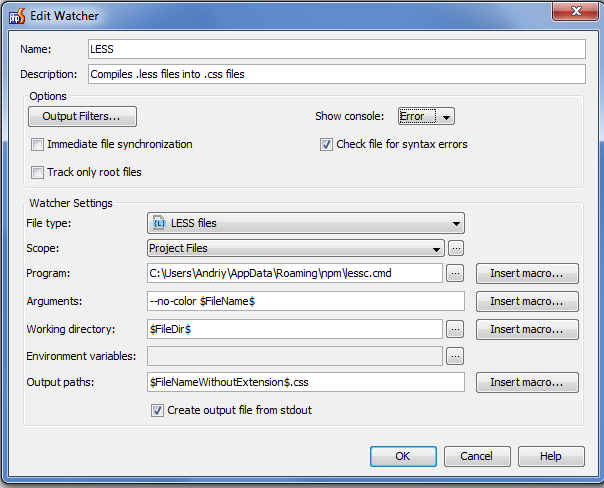 Yes I have added a watcher but it complains about "Please set a program to run" if I add (from the video) "/usr/local/bin/lessc". I tried pointing it to the less.js downloaded from lesscss.org but that gives me the error shown in my first post. So... where do I get the less "program" and how do I install it? This does not work out of the box and instructions so far have been fuzzy. As I understand less.js is for client side compilation(dynamicly in browser). But you need a server side compiler. Just install it with "npm install -g less". Output to a different folder: I have /less and /css in project and $ProjectFileDir$\css\$FileNameWithoutExtension$.css doesn't seem to work for output path. Compressing output. I'm guessing this is a 2nd watcher running on the css file? >Output to a different folder: I have /less and /css in project and $ProjectFileDir$\css\$FileNameWithoutExtension$.css doesn't seem to work for output path. >Compressing output. I'm guessing this is a 2nd watcher running on the css file? Weee! You rock Andriy! I'm on the awesome-wagon now! Thanks Elena. Best option for compressing less is to add argument --yui-compress. Then all you do is set up the folders you wish to watch. You can use standard LESS code to minify, (//simpless:minify)... I don't understand why the IDE doesn't yet have this baked in, where you don't have to install node on one of your machines. This plugin does it all, right from within the IDE. Cool Wes, I might try that out. It's one of those things though that once its up and running you don't have to worry too much unless and I like just having one place to set up multiple "watchers" for different things rather than separate plugins for LESS, SASS, JS, etc. Which seemed to work in 6.0.